If you didn’t know neuropathy is when nerves become damaged in this case for laryngeal sensory neuropathy or LSN for short in the larynx area which is another name for the voice box. This is basically most of the throat area which is right above the esophagus. 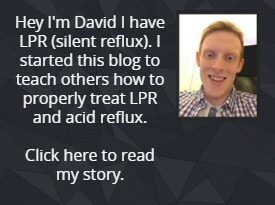 My blog here is primarily focused towards targeting and helping people with Laryngopharyngeal Reflux or LPR for short. If you didn’t know LPR is a form of acid reflux that causes irritation to the throat and larynx area just like LSN. The clear thing to me after learning more about LSN is that there is a clear relation between the 2. Both LSN and LPR have usually very similar symptoms. These laryngeal sensory neuropathy symptoms like coughing (neurogenic cough), lump in the throat feeling and throat clearing are common for both problems so there is definitely a relation between the 2. The thing is if you are someone who actually has LSN there is not a direct reason why it would be related to LPR, but it there could definitely be a correlation. Diagnosing someone with LSN can be quite difficult. Usually the best way to know if you have LSN is from a process of elimination. Meaning that you eliminate the possibilities that could cause it, some causes are things like food allergies, asthma, neck masses, autoimmune disorders, acid reflux(LPR) and many others. There is only one test that can really test for Laryngeal Sensory Neuropathy. This test is called SELSAP which means surface-evoked laryngeal sensory action potential. It is designed to test the function of the laryngeal nerves using electrodes. The problem with the test is that even when the test is positive it does show that you have neuropathy in your nerve, but it doesn’t show what is the root cause of this neuropathy. In regard to the problem being caused by acid reflux. It’s more common than you think. In this case the acid is constantly coming up and damaging and inflaming the throat area. This constant acid damage leads to neuropathy in the larynx area because of damaged nerves. Because LSN and LPR are relatively new problems they haven’t been researched well and current knowledge on them is low. For example, if someone’s LSN is because of acid reflux but you don’t have any typical reflux symptoms like heartburn your doctor/physician may immediately write it off. This is also particularly due to the lack of knowledge and education on LPR. As someone with LPR has no typical heartburn or chest pain like someone with GERD(Gastroesophageal reflux disease) would. This is also why LPR is sometimes referred to as silent reflux because it doesn’t give the other typical reflux symptoms. If you work out that your LSN is triggered by reflux that would be your own personal root cause of the problem. Once you target and treat the direct problem in this example acid reflux it can also help with treating your LSN. The thing is that acid reflux can cause LSN. Then if you treat the acid reflux properly the LSN may completely heal yourself over a period of time. Though for some people it may take much longer if at all. This is because of the prior damage the acid has done to the nerve. If you need more information on LPR check out my complete guide here. So, let’s say you think you have these throat symptoms because of acid reflux and you treat the problem properly. But even after this treatment you still have the problem with your throat after 2 months’ time. In this case it would be more likely you have LSN because of the nerve damage. Luckily there is some medicine which should directly help treat the LSN, let me explain below. If you believe you have treated or fixed your root cause for the LSN and the problem still persists then trying a direct treatment should be a good choice for you. One of the best medicines for this is called Gabapentin. This medicine is designed to calm the nerve down, so it stops it from sending faulty signals to your brain. The thing with this medicine is that it isn’t a pain killer and it won’t help with treating pain but only with calming your damaged nerve. This will often stop you getting the feeling of needing to cough or constantly clear the throat because the nerve is no longer sending the faulty signal. Its best to start with 1 100mg tablet of Gabapentin a day and if you have no negative reaction build up to take 3 of them a day. Even still 100mg 3 times a day is an extremely low dose and may be all you need to help. If you have no effect at that dose you may need to boost it to 300mg 3 times a day or up to a maximum of 600mg 3 times a day. It’s basically a slow build up to the point where you are getting the relief. For some people they may only need 100mg 3 times a day whereas with others they may need 600mg 3 times a day for it to work effectively. Taking the medicine may be a long process where you need to take it for many months if not years before your damaged nerve can completely heal. Because there is little research on this area it is hard to say for definite. It’s also worth mentioningThere was a study done where patients with LSN who had a chronic cough took Gabapentin. A total of 68% of patients saw relief in symptoms. You can read more about the study here. If you want more concrete evidence that your root cause is because of acid reflux there are a host of tests you can have done if that is the route you want to take. Probably the best test for knowing if your LSN is acid reflux related is called the restech pH test which is where they put a probe up the nose and down the throat and it will measure the acidity of the esophagus and throat for 24 hours. If it is more acidic than it should be the is a good sign your root cause is from reflux. There are also other tests like endoscopy and barium swallow but the restech pH test is the best for diagnosing this problem. On a final note – you shouldn’t treat the problem with medicine until you are treating the root cause of the problem. This is because while taking the gabapentin may help if they nerve is still being damaged by acid you will likely start to get symptoms again if you don’t treat the root problem! If for example you believe the acid reflux is the reason you could tackle it with some of my treatment advice in my LPR guide or read more about LPR symptoms to see if you have similar symptoms. You can also take my test which is a good sign to know if your LSN is being caused by reflux. The test is here. Previous articleBurning Mouth Syndrome – Can it be Caused by Acid Reflux?